you who don’t know, I create videos that tell the story of history and art history through art history visuals, maps, photographs, and illustrations with music and voice overs. Then based on the art history images that we’ve studied, we make hands-on art projects. It’s great fun to create and great fun for the children that use the product. But I didn’t expect it to expand my world quite the way it has, particularly in terms of the visuals in my head and my reading comprehension! Let me explain. Of course to put these videos together, and to review the life of the Apostle Paul, I started rereading Acts. Now I’ve taught Acts before, read Acts before, and even sat in Sunday School classes where Acts was explained. But this was different. For the first time, I started picturing the acts of the apostles in my head. I’m not saying that I actually was able to picture exactly what happened, but I had seen enough great art on the subject to be able to bring up those images when I read the stories of Acts. I was able to generate movies in my head! My comprehension of the book of Acts took on new meaning! That means when Stephen is martyred, I see the Jewish officials with stones in their hands, Paul sitting on the coats, and Stephen with his hands lifted up, praying to his Lord all in the painting by Orazio Wellcome. 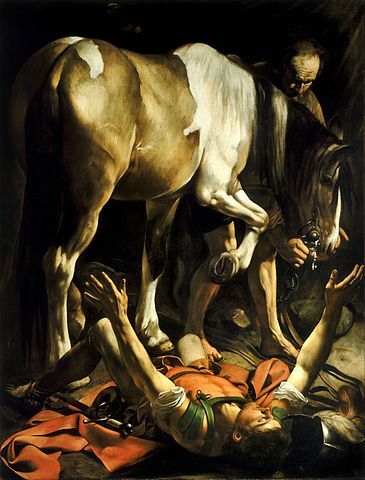 And when I read about Paul’s conversion on the road to Damascus, I can visualize Caravaggio’s wonderful painting of Paul laying under the horse’s lifted foot. There’s Paul, with his hand outstretched and his eyes unseeing, blinded by the light of Christ. And then, after seeing all the photograph’s of dusty roads in Rome, and including them in our video, I could picture the apostles, going out on those roads, spreading the gospel in their sandaled feet, walking staffs, and tunics. And this kept happening over and over! The healing at the lame man by Peter and John, the martyr of christians by Roman officials, it’s all there in my head! What a gift! For the first time, I really could experience Acts in a new way, and understand what was going on the Roman world of the apostles of Christ and the church. And it’s not just the Bible stories that I picture. I also can reference Ancient Greece in my head with its maps, its temples, and its stories. When the Trojan horse is mentioned, I’m there! Mention someone flying too close to the sun, and I picture Icarus through the art of the ages! This, my friends, is why we study history, add the art history, and do the hands-on projects. It is a gift to our children and ourselves! It enriches the world for our children in a way that just telling them about a subject never can. And when they read about a subject, we’ve given them visuals to reference in their brains and make movies in their head! That means we are increasing #ReadingComprehension skills without drills and worksheets! Should we as home educators really take time for art? Oh yeah! Take Time for Art’s Ancient Greece! Making Connections with Hands-on Projects! Welcome to TakeTime for Art’s The Middle Ages! Take Time for Art: Middle Ages Art Curriculum Review - peanut butter fish lessons on Welcome to TakeTime for Art’s The Middle Ages! Subscribe for Great Deals and Free Lessons!